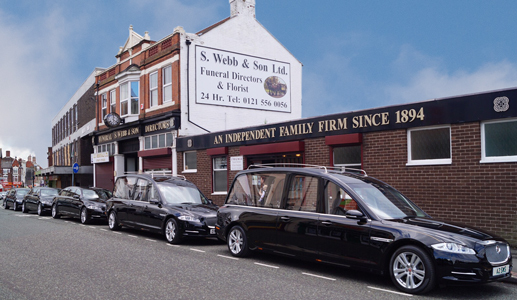 S Webb & Son Ltd is a long established Family firm of Funeral Directors who have been serving the families of the West Midlands and beyond for well over 100 years. We are still entirely owned and managed by the Great and Great-Great Grandchildren of the founder Meshullam Sidney Webb. We are still based in our original family premises in Upper High Street, Wednesbury and we also have offices in Church Street, Darlaston and Hill Top, West Bromwich. This way we can offer the very best caring and professional service to our wide spread and diverse Community. Whilst we are extremely proud of our heritage, the current generation of the family know how important it is to move with the times. So we offer caring and thoughtful advice on every aspect of the funeral, whilst providing a service which ranges from traditional funerals, through alternative options, to the most modern Green Burials and pre-paid Funeral Plans. If there is any question about which you are unsure, please don’t hesitate to contact us. We are available at any of our premises during usual office hours and on the telephone 24 hours every day. S. Webb & Son is a member of the National Association of Funeral Directors, and the Society of Allied and Independent Funeral Directors. To learn more about these organisations click on their logos.